It’s that time of year. Winter is upon us. With less sun exposure, less fresh in-season fruits & veggies, and with most of us spending more time indoors, coughing on each other and sharing germs, colds are bound to rear their ugly heads. The common cold is a viral infection of the upper respiratory system – your nose and throat. Symptoms may include: sore throat, cough, nasal congestion leading to a stuffed-up or runny nose, mild body aches, slight headache, sneezing, low-grade fever, and generally sense of yuckiness medically called malaise. Note! As your cold wears on, your nasal discharge may become thicker and may turn yellow or green in color. While your auntie might say that this means you have a bacterial infection and need antibiotics that is just not true at all! It just means that your body is fighting the cold off and may need a different remedy or more time. Most folks feel better after 7-10 days of having a cold. The flu is a variable thing and effects different people really differently. In my years as a primary care provider, I saw cases of flu ranging from mild to totally knocked out for days and days. Symptoms may include: Cold symptoms as above, plus high fever – often above 100º F (38º C), headache and muscle aches, chills, fatigue, nausea, vomiting or diarrhea. Not everyone with the flu gets a fever, but many do. The bone aches are the most common marker of actual, true influenza that I see in clinic. As with a cold, you do not need antibiotics for the flu! Some folks use Tamiflu, which is not something I would take personally, and is something you can get at your primary care provider. The flu usually lasts about two weeks in most people. I like to keep my cupboard stocked with the essentials so I can take control of my health when a cold or flu strikes. As always, I start with lifestyle, and add in supplements, herbs and foods to help support my immune system. The best supplements and herbs on earth don’t have a chance without the foundations of good health in place. These habits help us keep from getting sick and help us recover faster when we feel sickness starting. Focus on eating nutrient-dense foods like bone-broth, vegetables (both cooked and raw if you tolerate them), organic grass-fed meats & poultry, organic free-range eggs, nuts, and legumes if those work for your body. Avoid added sugar (berries and other fruits are okay in moderation), processed and packaged foods, fast-food, fried food while you’re sick (and in general!). Keep grains to a minimum, and get your carbs from vegetables and quinoa. Avoid all dairy while you’re sick – it’s a mucus-creating nightmare waiting to happen. Fruit juice is not your friend! Orange, apple, pineapple, mango, etc. These juices are just pure sugar. Nothing wrecks immune function like sugar! Our bodies detoxify and restore our cells overnight, while we sleep. It is vital to make sure you’re getting enough sleep and good quality sleep to keep your immune system working optimally. Turn your screens off at least 30 minutes before bed, keep your room cool, block your windows to keep the morning light out and consider wearing a sleep mask to help you sleep more deeply. Studies show that exercise can help boost our immune systems. Movement reduces frequency and duration of illness. While you’re contemplating that daily walk – studies also show that regular exercise, both cardiovascular and strength training/weight lifting, helps improve depression and anxiety, and can even reverse osteoporosis! Feeling like a cold is starting? Take a slow walk for 10-15 minutes to help give your adrenal glands a little boost. 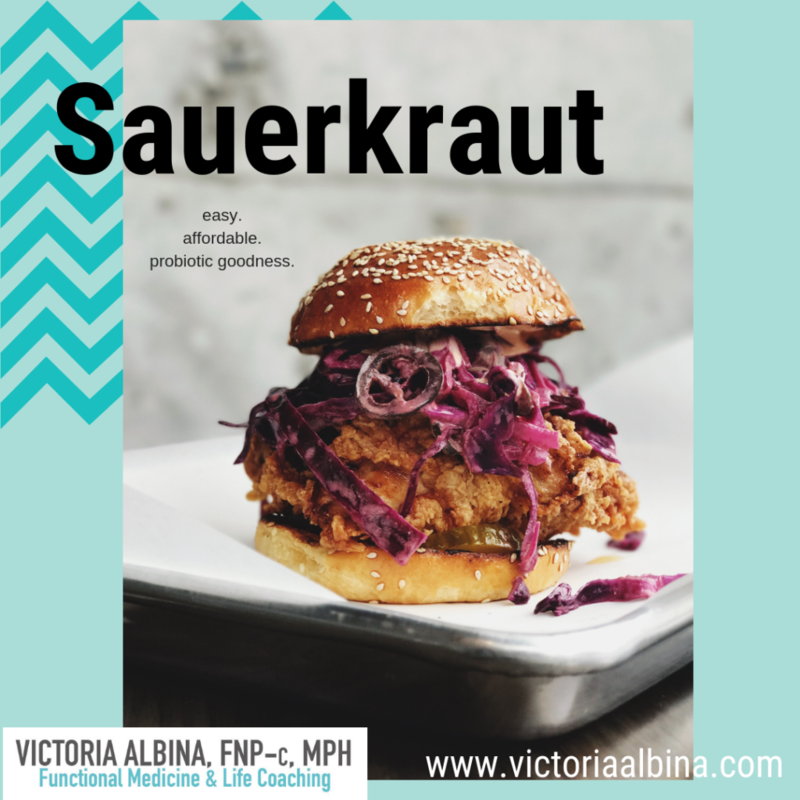 If fermented foods work for you, eat them every day. There are so many options to choose from. 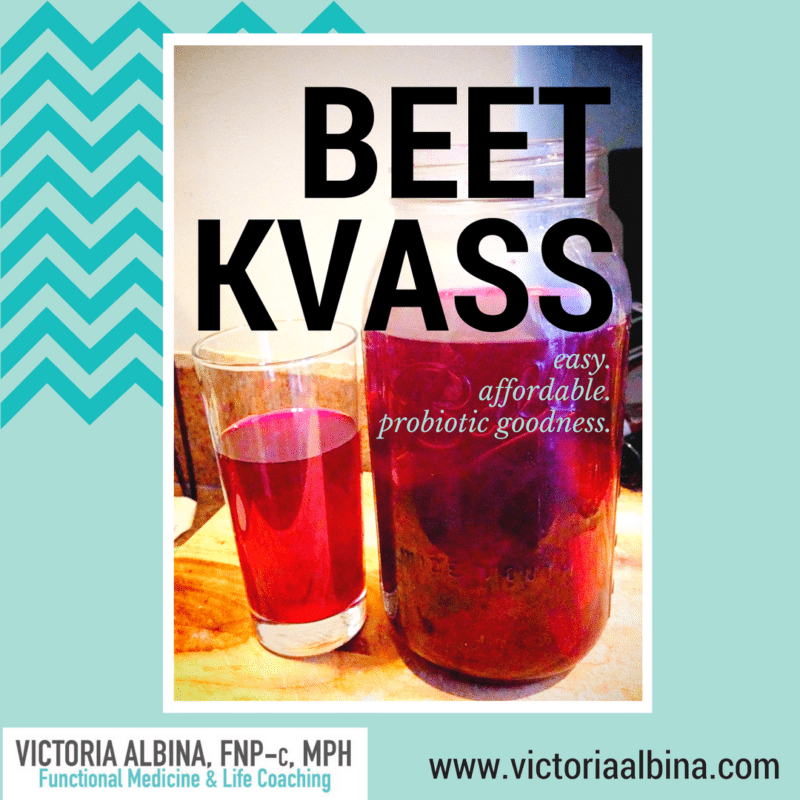 If fermented foods don’t sit well or if you have IBS or other GI issues, get care from a holistic or functional medicine provider such as myself – you really don’t have to suffer alone, and you deserve expert attention! Being in touch with our bodies can help us to see the earliest warning signs of a coming cold, so we can act quickly and thoughtful. You likely have most of what you need to get started with cold-fighting in your cupboard at home. Some you might want to stock starting at back-to-school time to have on hand should you need it. Heat helps kill bacteria, and washes them out of the throat and into the stomach, where the stomach acid will hopefully be able to make quick work of them. Pneumonia happens when mucous dries out gets all gunky in the lungs. Drinking lots of fluids is vital, and warm fluids are best. Gargling helps to loosen up mucous, actively kills bacteria and viruses in the throat, and stimulates the vagus nerve (article here) to help boost immunity. I recommend using warm to hot water (don’t burn yourself) and as much salt as you can reasonably tolerate. Gargle hourly if you’re serious about showing a sore throat the door, and 3 times/day if you’re just generally feeling sick. Don’t forge this one. It’s pretty much free, and it actually works. Gargling is good for your whole body, because it stimulates the vagus nerve. Read more about the vagus nerve here. Once again, the power of the microbiome is not to be ignored! Boost your gut microbiome and let it go to work moving those dead bugs on out. I am a woman obsessed with bone broth and have been for ages. Bone broth is a natural immune booster, and is easy to make. I always keep some in the freezer for when I need that boost. 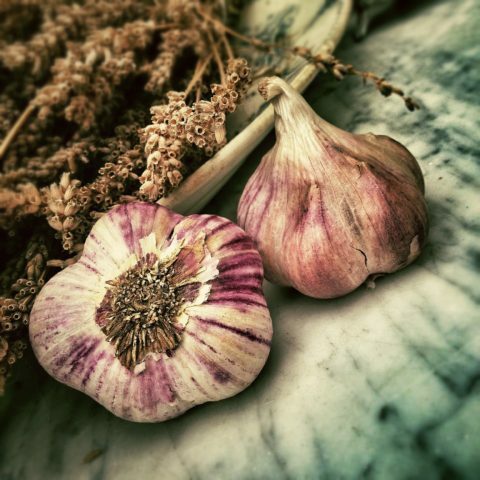 Allicin, the active compound in garlic is powerfully antibiotic, antibacterial and antifungal. I use garlic for a dozen different ailments. Cook with onions and garlic often, and especially when feeling sick. I love to make a hot tea with minced garlic, lemon juice and a shpritz of apple cider vinegar. It doesn’t taste awesome, so I just chug it when sick and go back to bed. Hydrotherapy is a time-honored tradition. A hot bath with magnesium-rich Epsom salts helps the body to rest, relax and the steam effect is phenomenal here too. The heat also helps you start sweating, which helps with the removal of dead cells. Antibiotic, antifungal, antimicrobial, and delicious to boot! Put 5-6 tablespoons of coconut oil in your hot tea or broth over the course the day. I also use it topically to soothe sore skin (like around the edge of your nostrils if you’ve been blowing your nose a ton). The lauric acid in coconuts is the super-start here, and can help kill of viruses and fungi. Remember how important it is to keep mucous thin and moving? Steaming is such a great way to do just that. I do this the millisecond I feel a cold taking hold, and it’s so useful. Breathe in deeply and hold your breath, alternating between mouth and nose breathing. Stay strong under there for as long as you can stand it – I usually tap out around 10-15 minutes. Expect snot! You will hopefully turn into a mucous-factory, and may cough more. That’s one of the goals! Better out than in, I say. Herbal Medicine for The Win! I have a deep belief in the power of herbal medicine. There is great science for the power of herbs to help prevent and relieve sickness. Some herbs you take on the daily, some you take once you feel the yuck. I’m listing just a few of my favorite homemade herbal remedies to help colds and flu, and recommend that you stock up on these before you need them. Some herbs are best as teas, and some as tinctures – alcohol or glycerin-based liquid concentrates that are easy to have on hand. If you have a place to grow herbs, I highly recommend it! It’s so cool to know just where your medicine came from. As always, check with your medical care team before starting any herb or supplement. 1. Echinacea (Echinacea purpurea or angustifolia): I always start with Echinacea for colds. When people tell me “oh that doesn’t work for me” the issue is often the form and dosing used. This herb can mess with certain heart drugs, so make sure to check with your clinicians before starting this one if you’re on heart drugs! 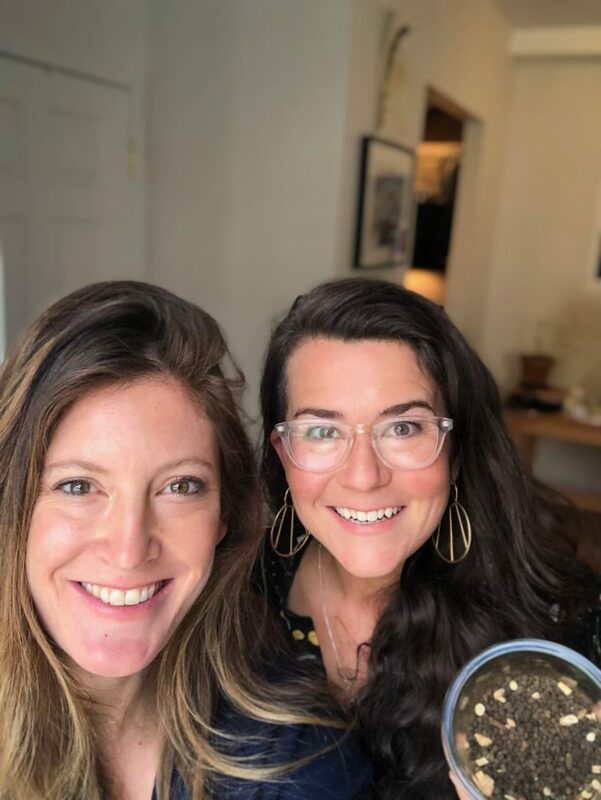 My beautiful friend Jessa Blades and I made some homemade elderberry syrup this fall! 2. Elderberry (sambucus nigra): Elderberry is amazing. I take it daily to help prevent cold/flu and up my intake if I feel a bug coming on. Elderberry helps reduce the duration and intense of colds and helps boost our natural, native immunity. And it’s Tasty! I make a massive vat of homemade elderberry syrup every September to get me through the winter. 3. Stinging Nettles (urtica dioica): I love love love Nettles. It’s rich in minerals and vitamins, and supports the liver in detoxifying the body. It’s powerfully immune boosting, and is vital for women’s health on the daily. I use nettles as an herbal tea, and rarely as a tincture. 4. Umcka syrup (Pelargonium sidoides): this South African plant is one of my go-tos for coughs and even bronchitis. The syrup is delicious and easily found at a health food or grocery store. I always have a bottle on hand! 5. Yarrow (achillea millefolium): this herb is a circulatory wonder, and is my go-to for fevers. I use it both in tea and tincture form, and start it early when it feels like the flu, in particular, is coming. Because yarrow increases circulation, it can help you start to sweat profusely. This is great for breaking a fever, and is helps with detoxification through the skin. 6. Hyssop, Eucalyptus and Sage: This combo is a powerful decongestant. I like to mix equal parts of these three as a tea, and sip it throughout the day when I sound like a muppet with a face full of yuck. 7. Mullein: Especially when paired with sage, mullein is phenomenal for supporting the lungs. I use these herbs in tea form, and also add them to a face steam. Mullein plays well with the blend above, and is great when there is nasal and respiratory congestion. Vitamin C: Perhaps the best vitamin for cold and flu, vitamin C in large amounts can greatly speed recovery. Vitamin C is one of the best vitamins for daily wellness, cold prevention and treatment. I start with 1 gram of a food-based form, such as acerola or camu camu, every hour, and stop when my tummy gets grumbly. Taking too much Vitamin C can loosen the bowels, which some folks do on purpose when they’re sick. It’s called a Vitamin C Flush and it’s well beyond this article, and an interesting thing to look up later, if you’re so inclined. I choose a food-based Vitamin C from acerola berries or camu camu, both of which come in pill form. Hibiscus and Rose Hips teas are also great forms of Vitamin C for daily use. Vitamin D3 + Vitamin A: I think one of the major factors in folks getting sicker in the winter is lower Vitamin D levels because we’re not getting sun exposure. I take 50,000 iu of Vitamin D3 (preferably in liquid or liposomal form) at the start of sickness, and take it for 3 days MAX. This is particularly helpful with the flu. – A fact that many folks don’t know is that you need Vitamin A together with Vitamin D to help reverse cold and flu. My go-to is way to get both A & D together is in Cod Liver Oil. Rosita is my preferred brand. Zinc: The body works hard to keep zinc levels up, and when they plummet, we’re much more likely to get a cold because our immune systems take a hit. I love zinc as a lozenge for sore throats and general malaise. It’s vital that you know when it’s time to see your primary care provider (PCP) or Urgent Care. Fever greater than 101.3º F (38.5º C), fever lasting five days or more, or fever that returns after a fever-free period; shortness of breath, wheezing, severe sore throat, headache or sinus pain, worsening night sweats. If your intuition says “this just isn’t right” then it’s likely not – listen to your gut, and get to care. Are 65 years old or older, are pregnant or have given birth in the past two weeks, have chronic medical conditions (including asthma, emphysema, heart disease, diabetes, neuromuscular disease, and kidney, liver or blood disease), have a weakened immune system due to medications or HIV, have a body mass index (BMI) of 40 or greater, or live in a long-term care facility, you may be more likely to have more serious ramifications of cold/flu, and should seek in-person medical care. So Where Should I Get All These Fabulous Things? I love to support my local, family-owned independent health food store or coop. That way the money stays in my community, and goes to actual People and not a massive corporation. Too busy to get to the store and want to buy online? I want to encourage you NOT buy supplements from stores that cater to body builders, big box stores, supermarkets or drug stores. Certain websites, named after rainforests, accept supplement returns for up to 90 days, and these supplements go right back into the supply chain. My fear here is that we don’t know if someone left the bottle of supplements that you are now buying in the trunk of their car in the blazing Phoenix sunshine for 88 days before returning it, or what else might have happened to it. I’ve had patients get fake supplements from this particular mega- retailer before – yikes! 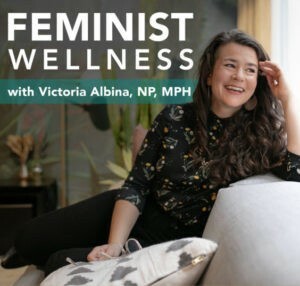 Avoid all of this AND get 10% off all supplements by signing up to use my online dispensary at Fullscript.com – a verified source for supplements trusted by clinicians everywhere. I mean, they’re Canadian… need I say more? 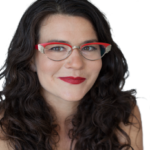 I make a very small percentage of sales from Fullscript, and will donate all sales stemming from this article to NYC’s homeless care shelters. It’s a win-win all around – you get dependable supplements, someone in need gets a hot meal and a safe place to sleep. What natural remedies do you use to help beat the flu or other illness? Share in the comments below!